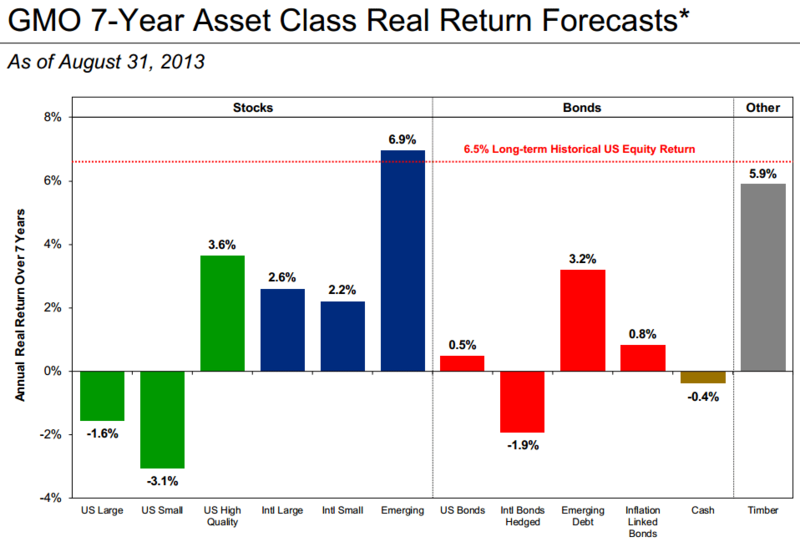 The GMO 7-Year asset class forecast is in my opinion a good sanity check for overall valuation levels. The expectations for emerging markets are a lot better than those for the developed world, although this graph doesn’t account for possible different risk levels. The expected average negative real return in the US certainly doesn’t mean that I don’t want to invest there: I believe that there is always a bargain somewhere. The odds of finding one are going down though, and I think that correlates with my experience so far this year. Fishing is easier when there are more fish in the pond. This entry was posted in General on September 16, 2013 by Alpha Vulture. While I agree with your analysis both Singapore and Hong Kong are considered ‘developed countries’ and are not in VWO (and in the GMO graph probably fall under to Intl. Markets). So the post is a bit misleading. Hong Kong (for example EWH) actually performed quite good. Good point, that’s why I recently added a disclaimer to the site :P. But I bet Consciencefood does fall in the emerging market category :). What are your thoughts on the fraudulent Chinese companies listed on these exchanges… Have you come across them when searching for bargains? I haven’t looked at a big number of Chinese companies listed in Singapore or Hong Kong. I do think that a fair amount of Chinese frauds have been filtered from the market, but that’s just a feeling, and I’m sure plenty of crap is remaining.